Remember how last summer the awesome readers of this blog generously contributed to my project so I could participate as a passenger on the Millennial Trains Project? We’ll this is one of the many good things that came out of the trip. I was thrilled to receive an email last week from two of the people I met on the train asking if I knew anyone that would be interested in hosting a screening of startupland in Pittsburgh. My reply – yes- of course, Pittsburgh would love to host a screening. A few emails later, TechShop kindly stepped up as the location for the screening. Thank you to everyone who made my journey on the train trip possible. I am so pleased that my fellow train passengers continue to think of Pittsburgh. One of the mentors on the train, who joined our group for the last part of the trip from Pittsburgh to Washington, DC is Jonathon Perrelli who (in addition to offering me some sage advice) is also co-producer of startupland. If you are interested in startups be sure to follow @perrelli on Twitter. 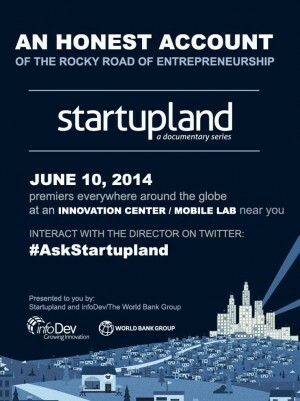 On Tuesday, June 10, 2014, Pittsburgh will be one of the many cities around the globe that will be hosting a screening of startupland a new documentary series about startups. Click here for the screening details. « Still looking for a summer internship? We’re looking for an Events Editor!